Marco Gentile was born in Acerenza, Italy, but moved to Canada with his parents as a young boy. There, he fostered his life-long ambitions, graduating from a prestigious law school, excelling in his law career and eventually moving into the corporate world as CEO of a automobile manufacturer. But when Mark faces strong opposition from the company's board of directors, he has to make a difficult decision that leads to a pilgimage to the town of his birth in a quest to discover himself again. Finding Marco is a gentle, quiet novel. Kenneth C. Cancellara weaves in many ideas that lead the reader to reflect on their own life and priorities as they follow along with Mark on his path. Cancellara's writing style feels a bit business-like to me, but his thoughts are personal and inspirational. He brings up questions of integrity and ethics within business, and balancing work ambitions with personal life. The first half of the book is very focused on business strategy, business decisions and weighing the needs of a business with the needs of each individual who is involved. Then Mark moves on to Acerenza to reevaluate his life and priorities more personally. The novel is about Mark's journey away from the business world to find himself and discover internal happiness and contentment. As such, I think it would appeal mostly to those who have some background or interest in business as it may be difficult to relate to Mark without that. 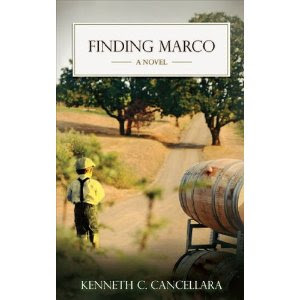 This review was written based on a copy of Finding Marco that I received from Phenix and Phenix Literary Publicists for an honest review. I am interested inreading this book. I am a follower - through my google reader. This book sounds very interesting especially from a Italian expat's point of view like mine. I'd love to read it. Thanks for posting about it. Ciao. A.
agramolasands6 at hotmail dot com. Sounds very interesting - this is the first time I've heard of this book. Thanks for the review! I would love to read Finding Marco :) *Thanks* for the giveaway! I would love to win! I'm a follower, and of course you can reach me thru my blog :) hugs!